Baby asleep in Bassinet Row. Picture by Shira Gal. 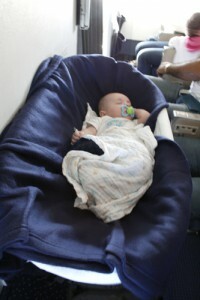 Most long-haul airlines provide a limited number of bassinets for babies to sleep in during the journey. These are located behind the bulkhead(s) in the aircraft so the bassinet can attach to the wall. Is it for your baby? Will your baby sleep in a bassinet or want to be held? The cost of the extra space: Bassinet Row normally has great floor space and leg room but has the disadvantage during take-off and landing of having to have this space clear – everything needs to go into the overhead locker, so not accessible during this part of the journey. This can be a challenge if you have older kids. Note: many airlines will not allow children to sleep on the floor. Bassinet seats are generally booked when you choose your seats when booking but can also be done later. When you have a larger family, it can lead to issues of splitting the family. Also, when booking online, it will generally only allow the infant and one parent to book in bassinet row and not other siblings or the other parent. This can be a real problem and often necessitates a phone call to try and override the default system. The key to securing your bassinet seats and deal with any issues is ‘get in early’. Babies must be removed from the bassinet during: take-off, landing and when the seatbelt sign is engaged during turbulence. This last one can be difficult as you may need to wake a sleeping baby at an inopportune time. We found having bassinets very useful when we just had 1 or 2 young ones but by the time our oldest became 4 or 5, we opted to not have the bassinet seats for our 3rd & 4th babies but rather book out a row or two on the plane!